So why my jaded attitude? Because I wonder (again) what it is we actually expect to happen to these OERs (how many OER projects re-use other peoples’ bids to get funding? How many reuse each others ‘what are OERs stuff’? How many OER projects ever demonstrate a remix of their content, or a compelling reuse of it? How many publish their sites as a wiki so other people can correct errors? How many are open to public comments, ffs? How many give a worked example of any of the twenty items on Liam’s list with their content, and how many of them mix in other people’s OER content if they ever do so? How many attempt to publish running stats on how their content is being reused, and how many demonstrate showcase examples of content remix and reuse. And so is open documentation. They probably all could come under the banner of open information resources, but thy are differently useful, and differently likely to be reused/reusable, remixed/remixable, maintained/maintainable or repurposed/repurposeable. Of them all, I suspect that the opencourseware subset of OERs is the least re* of them all. If You Don’t Like REF, What Are You Gonna Do About It? I have to admit that I’m still not totally sure that I know what digital scholarship is all about, or its relationship to celebrity blogging, so I thought I’d try to consider it in terms of what it means for ‘outreach’. When I started out as an academic at the OU ten or so years ago, I fell into the whole schools outreach thing, delivering hands-on robotics related activities all over the place (including a trip to Japan with a group of Blue Peter competition winners, a blagged film preview, the occasional public engagement grant and so on…). This naturally led into the idea of ‘in-reach’, helping programme the first few RoboFesta-UK meetings for robotics educators and interested parties in schools, HE, and industry, running the Creative Robotics Research Network for a couple of years, and convening a couple of workshops at SGAI (one on public engagement around intelligent robotics, the other on ethical issues in intelligent robotics research). So what has this to do with digital scholarship? Well, if the digital scholar is to trad academic, what is digital outreach as to trad outreach? Can we plot a similar evolution in the communication activities of digital academics, from telling folk what’s good for them though our blogging activities, through trying to engage them in conversation (or at least, trying to get them to spread our crude attempts at video making as viral warez), to engaging with policy makers on twitter and via gov departmental blogs? Because really this whole post is a badly contrived attempt to plug the WriteToReply republication of the Research Excellence Framework consultation document. As with every other WriteToReply republication, each paragraph has a unique URI that you can link to from a commentary on your own website; you can also comment directly on individual paragraphs, as well as subscribe to comment feeds on a per section or per commenter basis (see here for more details, including information on how you can use the republication to formulate your own official response to the consultation). So go on, what are you waiting for…?! PPS it seems as if University of Leicester Library is already pre-empting part of the outcome: Job Ad: Bibliometrician (bibliometrics feature quite strongly in the consultation). Author Tony HirstPosted on October 5, 2009 October 7, 2009 Categories Anything you want, PolicyTags WriteToReply1 Comment on If You Don’t Like REF, What Are You Gonna Do About It? One of the easiest ways to get started with DeliTV is to use it to watch video feed subscription from YouTube. We can now bookmark this channel guide so that it appears in a DeliTV multiplex. In the following example, I’m bookmarking it to my main delitv feed, and also to the boxeetest5 multiplex. PS a new feature, currently in testing, lets you bookmark a search results page. 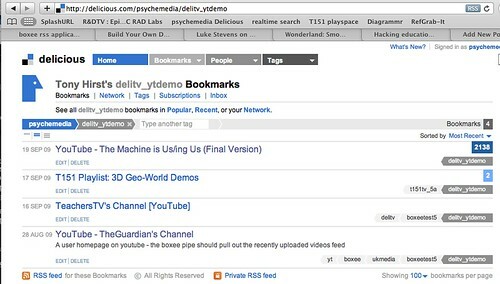 Whilst it is possible to generate searches for playlist or users/channels as well as videos, DeliTV currently returns just the 20 most relevant Youtube videos when a Youtube search results page is bookamarked. But then again, I suppose my ISP could record the URL of every page I visit if it wanted to…? Earlier this year, Google opened up a Google Apps Authorised Reseller programme (announcement) that encourages third parties to support, and sell, Google’s online applications. With Google just announcing that they are going to launch a “dedicated Google cloud for government customers in the US” (Google Apps and Government) I thought it might be timely to do a quick survey of the training materials that Google already provides, to see whether there was enough already in place for us to produce a quick wrapper and get a course launched. There are also various API libraries that don’t (yet) have training associated with them; e.g. 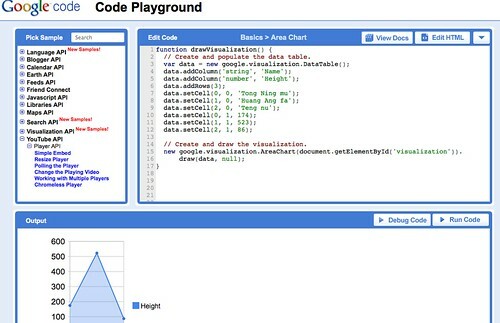 Google visualisation API, (see a list of all the available Google Developer “products” here: Google Code: Site Directory), as well as things like the Google Code University. Just by the by, on the UI design front, the flickr Design Patterns collection is worth a look, as is UI Patterns; and Product Planner is a handy resource if you want to get into the right state of mind for thinking about user flows through a website. PS as this post has largely turned into a round-up of Google stuff, it’s probably also worth adding these in: Google Research publications and Google Talks. [All Art Media, Inc. ] (the “Company”) owns and operates [Delicious TV]. (“Trademark”) registered on March 14, 2006.
use of the Infringing Trademark and the seizure of infringing materials. avoid pursuing any further legal remedies. equity, all of which are expressly reserved. Now, as far as the ProgrammablWeb goes, I don’t think I was registered/logged in when I submitted the hack, which means I can’t change any of the details there. But is it my responsiblity to now go round the web trying to clean up all mentions of Deli TV? If you have posted anything about, you know, that hack, please modify it along the lines of, I dunno, “Deli TV”. Ho hum… Anyway – Deli TV, then? Or the “The DeliBox?”…? Which do you prefer?